Welcome to the home of Diablo - newsfeeding and newsreading server software. Diablo is a comprehensive newsfeeding and newsreading software package that was originally developed by Matthew Dillon and now run as an open source project. Diablo currently requires XMake to compile. XMake is available from the downloads page. The latest release version of Diablo is 5.1-REL. This and previous versions of Diablo are available from the OpenUsenet Diablo download page. Fix a posting corruption bug that has existed since the original Diablo - highly recommended to upgrade to fix this. Maximum Age Policy - controls maximum article age. Changes to hashfeed - REQUIRES CONFIG FILE CHANGE if hashfeed is enabled. 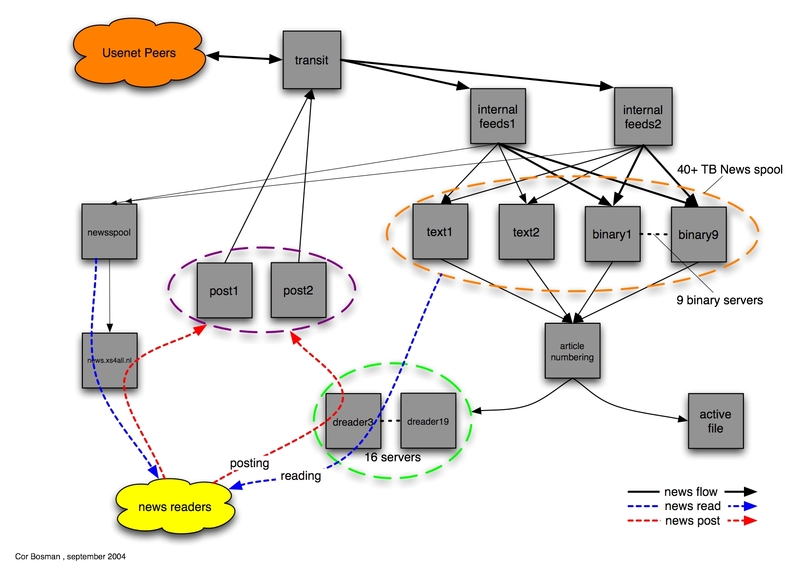 New contrib/ for 'feedgraph' - RRD graphs for feeds. New dreaderd dserver.hosts options 'retention' and 'groupdef'. Extension fo dexpire '-s' to sync after a number of files deleted. Various improvements to mmap and madvise compatibility. Many, many other smaller additions, fixes and performance improvements. Full details of the changes can be found in the RELEASE_NOTES. Lists of major changes between older versions of Diablo are also available. Please report any bugs to diablo-bugs at openusenet.org. Most of the Diablo documentation is included in the source distribution. This includes the README. * files, man pages and most importantly, the example files which are heavily commented. The mailing list archives (see below). Lew Payne has kindly written a step-by-step example to setting up a Diablo feeder. I have written a simple guide to setting up a Diablo reader complex. For those interested in seeing how the various parts of Diablo fit together in a large news system, Joe Greco has an excellent ascii art picture from his slide show presented at SANE2000. and Cor Bosman has made a more colourful picture of his installation available. Notes for prospective developers and submitting patches. diablo-users - open list for general discussion concerning Diablo and it's development. To subscribe, send an email message to LISTNAME-request@openusenet.org (replacing LISTNAME with the name of the list above) with the body of the message containing the single word 'subscribe'. You can also subscribe by following the links above, which include access to the mail archives if you are subscribed. If you are interested in an alternative to Diablo for newsreading and newsfeeding, INN is probably what you need as the next best thing in free Usenet server software. The word 'diablo' means 'devil' in Spanish.